On January 28, 1854 by decree of Court, the Township of Sewickley (not to be confused with Sewickley Borough) was created from a section of Ohio Township. The surface of the township was exceedingly hilly, heavily wooded and the scenery was quite wild and beautiful. The first settler of the township was believed to be Frederick Merriman who came here around 1808. He bought 300 acres for a gun, an iron kettle and a sled. A Methodist preacher. Thomas McClelland come around 1811, he held services in his home. Wild game was abundant and forests were cleared for farmland. As the community grew, three schools were built. Some coal was mined but not exten¬sively. As railroads in the area expanded, ties were needed and many were cut from the wooded sections on Turkeyfoot and Sevin Roads by the Sevin’s lumber company. Around 1890 oil and gas were discovered and in a short time wells dotted the countryside. As the township was settled and the population grew, the citizens decided they needed a new form of government. On March 14, 1960, again by decree of the Courts, Sewickley Township officially became the Borough of Bell Acres. The Borough has sustained slow moderate growth with a population of 443 people in 1 870 to approximately 1350 at present. The Borough contains 5.5 square miles with most of this comprised of single family homes. Borough Council meetings are held the second Monday of each month at the Big Sewickley Creek Fire Hall 1859 Big Sewickley Creek Road. 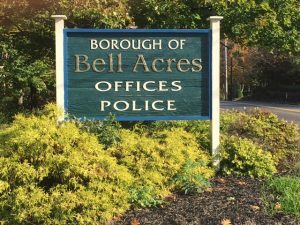 The following meetings are held at the Bell Acres Borough Building located at 1153 Camp Meeting Road. Residents choose their own refuse collector. Bell Acres Municipal Park is located at the corner of Big Sewickley Creek Road and Hitzel Hill Road. Hours for this park are sunrise to sunset. Bell Acres Nature Pork located at the corner of Turkeyfoot Rood and Sevin Road. This is a non traditional borough pork with over 200 acres which can be used for biking, bird watching, etc. Hours for this park are sunrise to sunset. There ore no facilities located at this pork. This park also contains the Bell Acres Nature Trail which was created with a joint effort of the Quaker Valley High School Earthforce 200] Group and Bell Acres Borough. This trail is 3/4 of a mile long and ends at the Merriman House Foundation. The Merriman Family is believed to be the first settlers in the area. Bell Acres was very fortunate to have all of this land donated by the Western Pennsylvania Conservancy. This land will remain park land in perpetuity.